is a local guide with over 10 years of experience who has worked with big trekking companies, such as Trekking Hellas, guiding trekking and rafting groups through the trails and rivers of the vast area of Pindos and the Zagori district. He is also a certified guide for rafting, canyoning and spelaeology, and a snow-shoe guide during winter. Encounter a large variety of wild animals such as the brown bear, the wolf, the lynx, the jackal to name a few, crystal clear alpine lakes (Drakolimne) and rivers (Voidomates, Aoos) and some of the most beautiful traditional villages of Greece, with houses made of stone, located in Zagori. 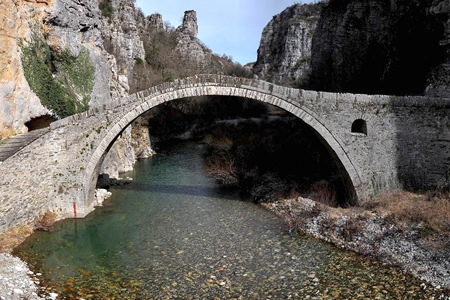 Double and triple arched stone bridges (Kokkorou, Arkouda), as old as 1000 years, will leave you spellbound. The Pindus Range, where the Zagori and the National Parks of Vikos-Aoos and Valia Calda are, stretches from Northern to central Greece. 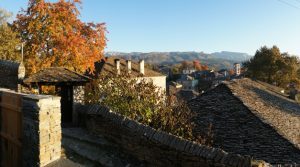 Scattered throughout these mountains are Zagori stone villages nestled on the sides of precipitous mountains amidst occasionally thick oak forests. The inhabitants are descendants of semi-nomadic people and their inaccessibility allowed them some autonomy during Ottoman times. Trade routes were established by building stone paths and roads to accommodate mule caravans which now serve as treks for the adventurous. The trails (treks) themselves suit varying levels of fitness, so all can find their match. This is a mountain lovers paradise! What better way to get to know the area than by trekking the numerous trails of the Zagori and National Parks areas with the safety of a local trek guide.